Step aside, Pikachu! Eevee is easily one of the most popular Pokémon, earning its own Pokémon Go Community Day event as well as the title role in one of the upcoming Pokémon: Let's Go games for Nintendo Switch. There's no doubt about it, this precious ball of fluff and its "Eeveelutions" are certainly fan favorites. At this time, a total of five of the eight possible Eeveelutions are available in Pokémon Go. Trainers can obtain Flareon, Jolteon, Vaporeon, Espeon and Umbreon. The Ice-type Glaceon, Grass-type Leafeon and Fairy-type Sylveon are not yet available in Pokémon Go, but will likely be added in future updates. 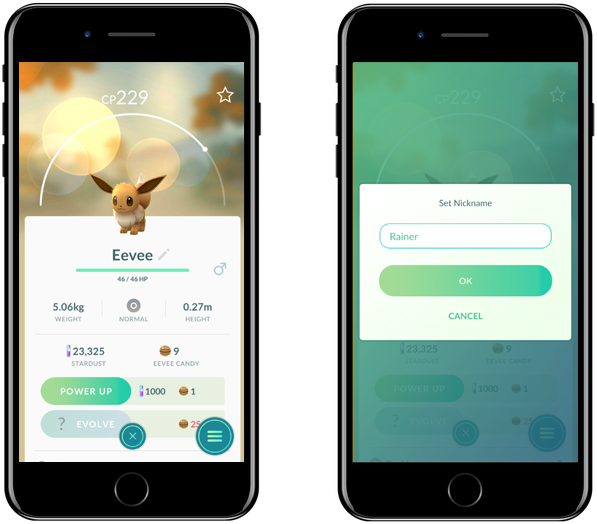 In the meantime, we’re going to focus on how you can guarantee which Eeveelution you’ll obtain upon evolving an Eevee in Pokémon Go! Each time you use 25 Eevee Candy to evolve an Eevee, it will randomly evolve into one of three possible Eeveelutions: Flareon, Jolteon or Vaporeon. If you’re looking to evolve Eevee into a specific evolution, you can control it by renaming the Eevee prior to evolving it using Candy. It’s important to note that you can use this naming method only once per Eeveelution, so you may wish to wait until you have a high CP version of the Eevee you want before using this guaranteed evolution method. Once you’ve used each name, you’ll have an equal chance to receive Flareon, Jolteon or Vaporeon at random when evolving. Renaming a Pokémon in Pokémon Go is extremely simple! You may want to close the app and reopen it to ensure that the name change has correctly gone through. Once you’ve named your Eevee, you’re free to spend the 25 Eevee Candy to evolve it. As long as you haven’t yet used the name you’ve chosen to evolve a previous Eevee, you’re guaranteed to receive the corresponding Eeveelution! It's worth noting that you can rename your Pokémon again at any time, so you aren't stuck with "Sparky" forever. Using the aforementioned naming trick is the only way to guarantee which of the Generation I Eeveelutions you’ll receive when evolving an Eevee. Once you’ve used this trick for each Eeveelution, you’ll have to randomly evolve Eevee with an equal chance to obtain Flareon, Jolteon or Vaporeon. You won’t receive Espeon or Umbreon through these random evolutions. They have more specific methods of obtaining them, which are detailed below. You can easily guarantee your first Espeon or Umbreon using the naming trick detailed above as well. It will grant you the respective Eeveelution regardless of any other evolution conditions. It’s important to note that you cannot obtain Espeon or Umbreon by blindly evolving Eevee using Candy. Instead, once you’ve used the naming trick once for each Pokémon, you’ll have to follow specific steps in order to obtain additional Espeon and Umbreon. Utilizing the method outlined below allows you to consistently guarantee which of the two Eeveelutions you’ll obtain, which is a good thing. In order to evolve an Eevee into Espeon or Umbreon, the Eevee must be set as your Buddy Pokémon and have 10 km walked with two Candy collected. You’ll earn one Candy per consecutive 5 km walked with a single Eevee, so you’ll meet both of those requirements simply by walking with an Eevee as your Buddy the full 10km. Once the above criteria is met and you’re ready to evolve the Eevee, it must be set as your active Buddy prior to evolving. Simply put, don’t remove Eevee from the Buddy slot until after evolving. It’s important to note that the Eeveelution you’ll obtain with this method is completely based on the time of day at which it is evolved. If you want the Psychic-type Pokémon Espeon, evolve your Eevee during the day. 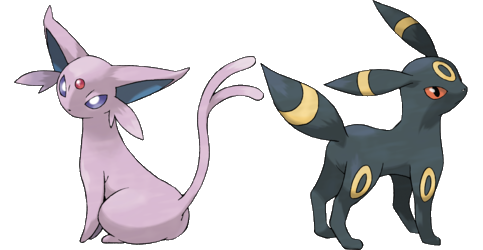 If you want the Dark-type Pokémon Umbreon, evolve your Eevee at night. Using this method to evolve Eevee will guarantee your selected Pokémon every time, making it much more controllable than efforts to obtain their Generation I evolutions.